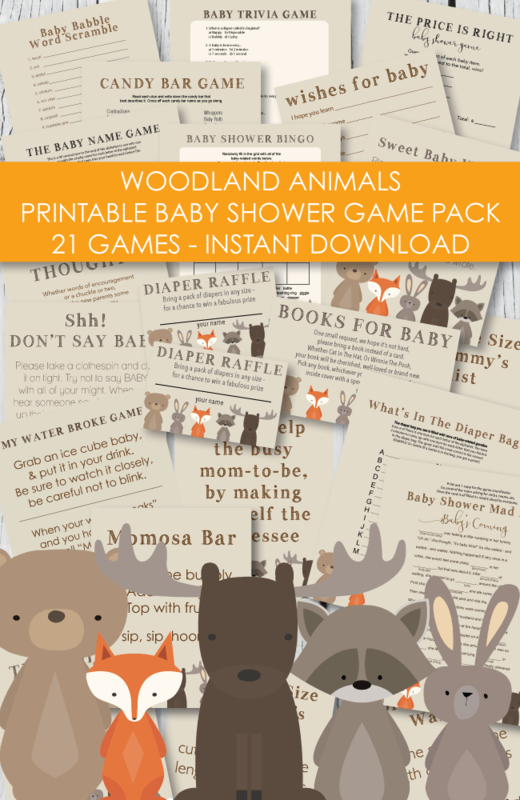 FREE Mickey Mouse Baby Shower Invitations & clipart - Minnie Mouse too! We have put together a showcase of adorable Mickey Mouse Baby Shower Invitations, Clipart, Decoration Ideas, DIY Crafts and more! And we can't forget about Minnie Mouse! 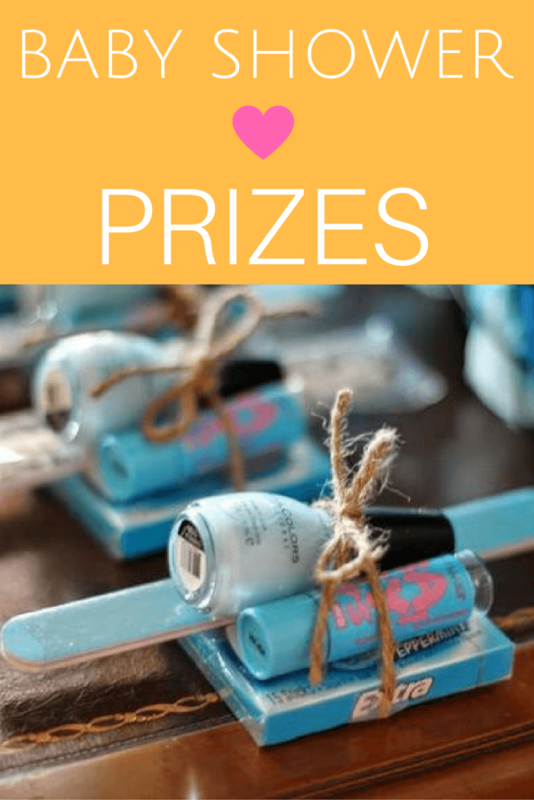 She is just as popular as Mickey - so we included cute ideas for a Minnie Mouse baby shower as well! We made these Minnie and Mickey Mouse Clipart in 3 sizes! 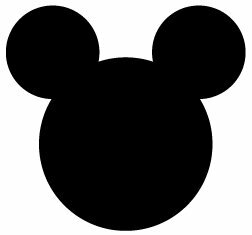 They are free to you - all you have to do is click on the FREE Mickey Mouse Clipart picture to open and print Mickey. 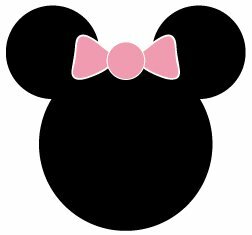 And click on Minnie to print the FREE Minnie Mouse clipart. 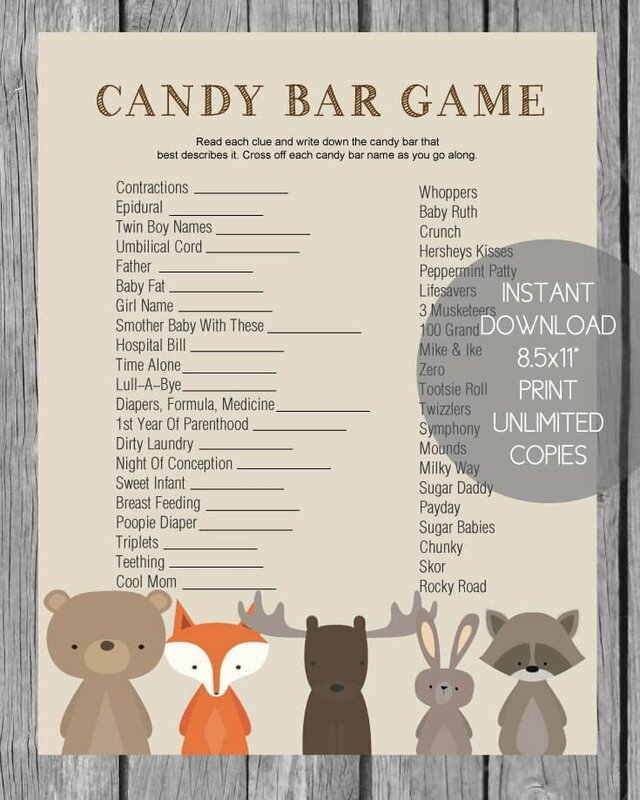 Print onto card stock to make baby shower garland, confetti, signs, etc. Print onto sticker paper to make cute stickers for cups, water bottle labels, vases or mason jars! 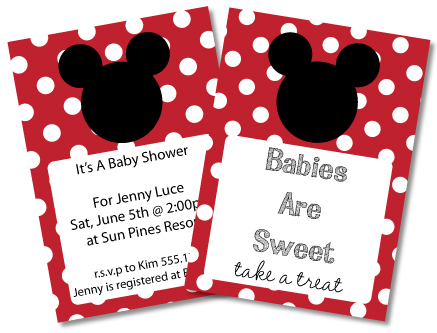 Free printable Mickey Mouse Baby Shower Invitations - right-click on the picture to download them. 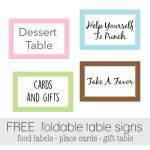 CUSTOMIZE WITH YOUR OWN WORDING - USE FOR INVITATIONS, THANK YOU CARDS, SIGNS, ETC. These Mickey Mouse cards measure 5x7", and fit in size A7 envelopes. We made these cuties just for you and they are free to use! Simply right-click on the picture above to download them. Then, make sure you open them using Adobe Reader (free at www.adobe.com/reader). The baby shower invitation templates can be customized with your own wording - click into the card and type in your message. 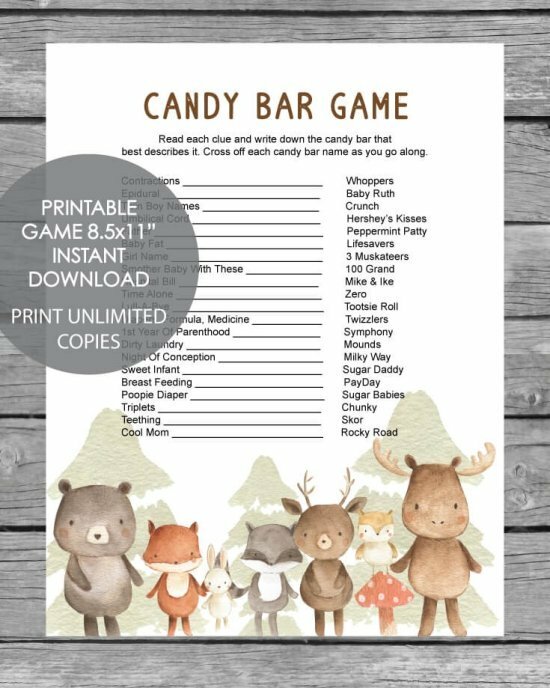 Perfect for baby shower thank you cards, menu cards, table signs, invitations, picture frame inserts (add a picture to the white part of the card and place into a picture frame.) Enjoy! 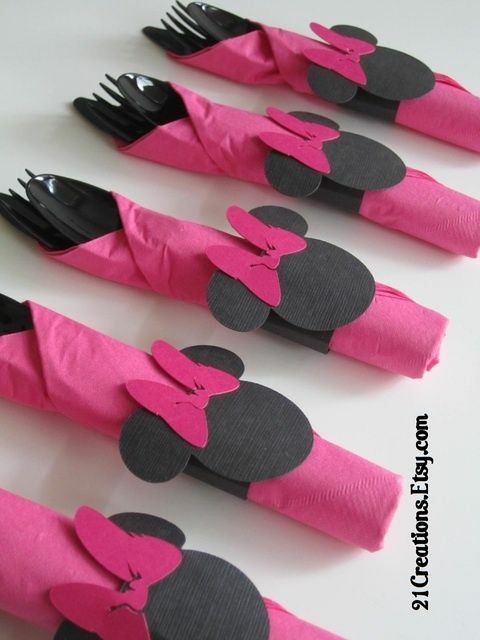 Free Printable Minnie Mouse Baby Shower Invitations. Right-click on the picture to download them. These Free Minnie Mouse baby shower invites are 5x7", and fit in size A7 envelopes. 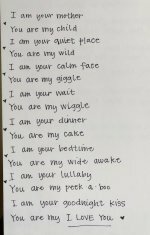 Customize the baby shower cards with your own wording - click into the card and type in your message. 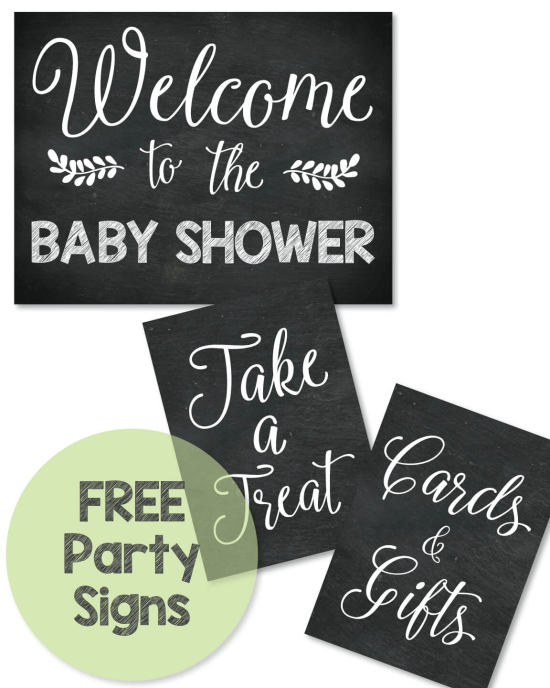 Use for baby shower thank you cards, menu cards, table signs, invitations, picture frame inserts and whatever else you can dream up! 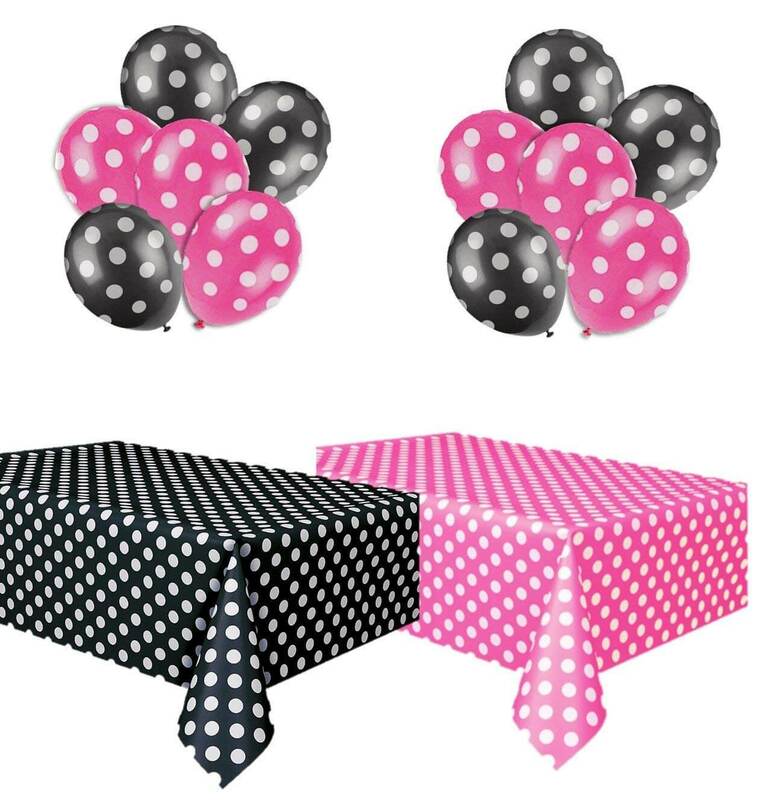 Adorable pink and black polka dot Minnie Mouse party decor - so cute for a baby shower or kid birthday party! Click pic for info. This Mickey Mouse Diaper Cake is perfect and we love it! 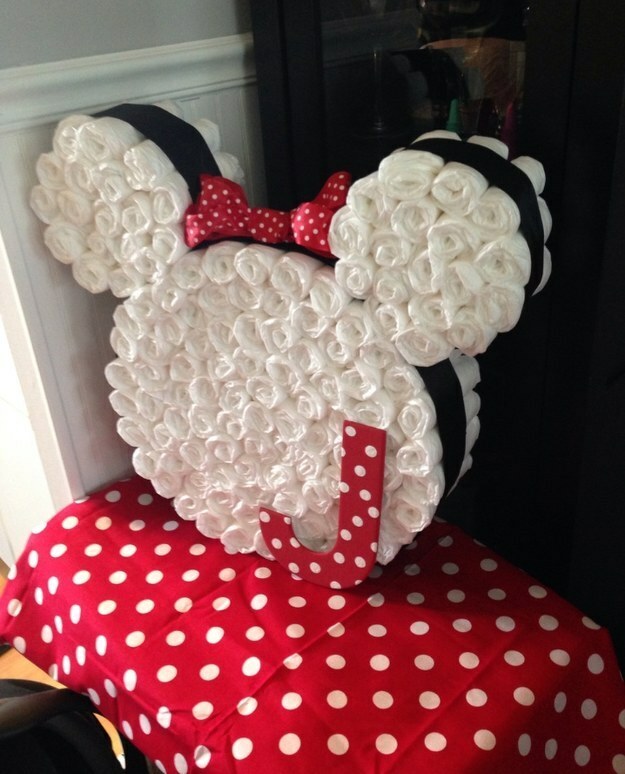 You can make it a Mickey or Minnie Mouse diaper cake by adding the bow or leaving it off. Roll and secure approximately 100 diapers with clear tape (rolled, so it can easily be removed), and cute ribbon. - get a great deal on diapers here. 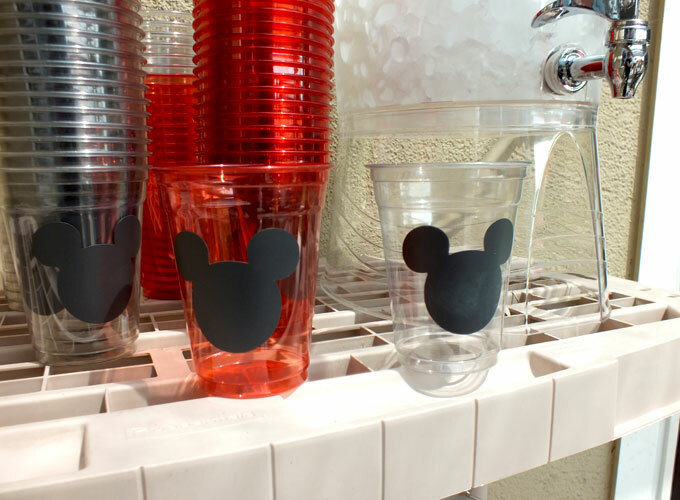 If you're hosting a Mickey or Minnie baby shower, chances are you need some cute baby shower plates and napkins and other cute supplies! 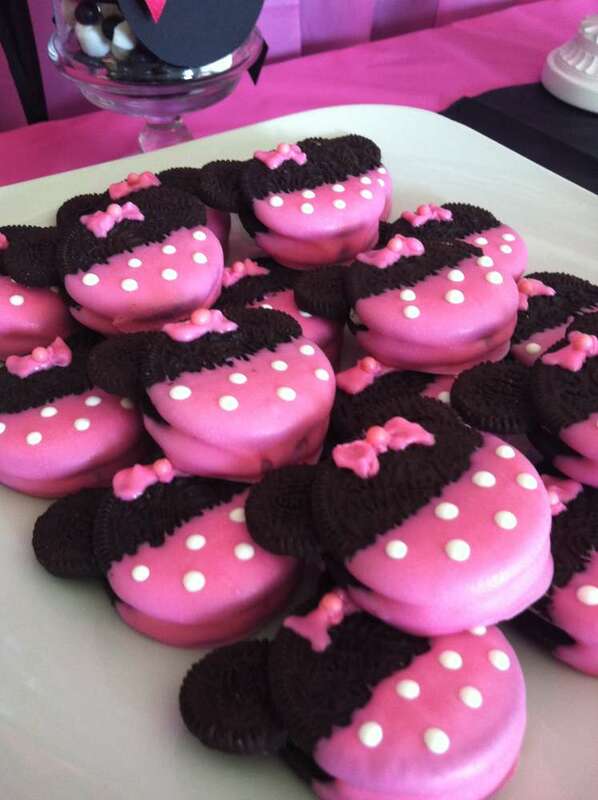 These DIY Minnie Mouse Oreos are just perfect! Dip half of each Oreo into melted white chocolate that has been tinted with pink food coloring (I also think you can buy coloring melting chips at crafts stores now) - Use red if you want Mickey Oreos. Pipe on white polka dots and add a bow if you are making Minnie Mouse baby shower cookies. To make the ears - use mini Oreos and take them apart so you are only using half of the cookie. Scrape off any excess filling and then gently wedge the cookie in between the large cookie. You can also add a bit of the left over melted chocolate to the end so it will fit snugly in between the large Oreo without moving. 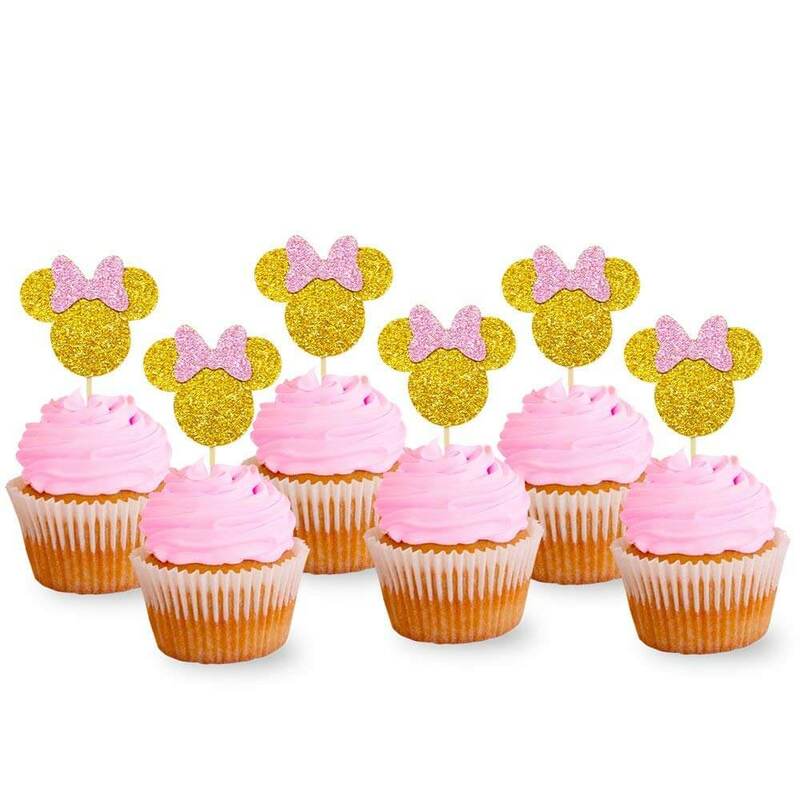 Adorable Minnie Mouse Cupcake Picks With Pink And Gold Glitter! Click pic for info. 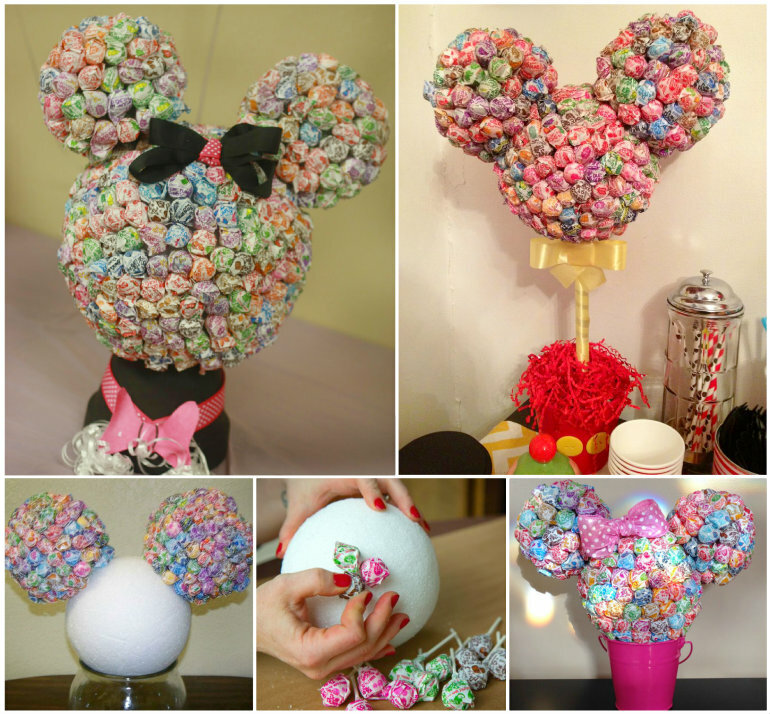 Start poking the lollipops into each ball (leave blank spaces where the Styrofoam balls will be touching) - Secure with dowels and a bit of hot glue (using a hot glue gun). Easily make into Minnie Mouse by adding a cute bow! 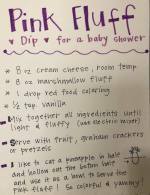 Visit our DIY baby shower crafts page for more fun projects. We hope you have enjoyed all of the fun Minnie & Mickey Mouse Baby Shower Invitations, decorations and supplies! 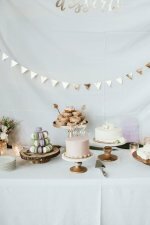 This is a popular baby shower theme among our readers - so we thought we'd put together a page full of inspiring ideas! Print out the FREE minnie mouse clipart or FREE mickey mouse clipart above - and use it for easy, DIY napkin rings! Such a cute look for hardly any money!